THANKS for nominating me Vinnie, how kind of you! I’ll try to do this sometime later this week, it’s pretty fun to do! You’ve been one of my kindest and most loyal supporters Ruth. Nobody Does It Better is an absolute tune. Bond music is just a whole genre of its own I think. I am with you on the pointlessness of remakes. Some worked though. Cape Fear with de Niro was a nice treatment of the old story. You will have to get a ‘virtual’ trophy cabinet, V.
Cape Fear was a rare good remake, don’t see many of them. My view is that if it ain’t broke, don’t fix it. I hate how Hollywood churns out endless remakes. Can’t they come up with something original? That’s not a bad thing, you’re a wise guy. Haha, nice answers! No joke, someone I know actually sent his girlfriend a custard slice through mail. I tried my best to be witty with your answers, the lat two made me laugh! A custard slice? That’s unusual. Unusual indeed. They’re great in Wales! You did a fine job with your wit, don’t you worry. Thanks, I often wonder how funny I am. Great news. I always attempt to have my line of questioning be as entertaining as it can be. You give good answers and opinions I must say. How could I not think of you? 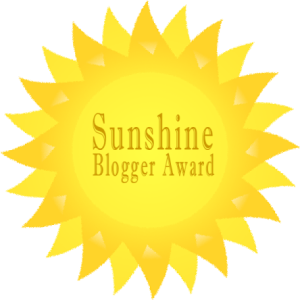 You’re a radiant light in the blogging world! I’m not sure about the best, but I welcome that lovely sentiment with open arms. You’re just too legit to quit! That’s what people keep telling me. Congrats on two awards. I like all the answers. I like Morgan Freeman also, but I also like Denzel Washington. Once he said, put your slippers way inside under your bed, so you have to kneel down to find them. When he payed good guy, he didn’t get any award, only when he payed bad guy, he got the sward, but he payed it real well. Congrats again! Thank you very much, I too like Denzel a lot. He is a stalwart performer if ever there was one. I think I watched most of his earlier movies! Thank you for the nomination Vinnieh! I’ll answer the questions soon! I was glad to nominate you. I like your answers to both sets of questions. Spanish is my favourite language, and I just love John Barry. He is an epic film composer. I also think it is so cool to have Bittersweet Symphony as your favourite song. It’s like a slap on everyone’s face when you mention it, really. John Barry is a legend. His music for the Bond movies is totally sublime and unmatchable. And I dare someone not to sing along with Bittersweet Symphony when it comes on the radio? Thrilled that you’re making an exception for me Meg. I’ll work it on it soon! I love a bit of Bittersweet symphony! It’s just one of those songs that I can help but sing along to. Hi Amanda. I love the way that the song continues to build as it goes on. Yes, me too! And the video was great too! One that sicks with you! Congrats on two noms, and GREAT answers, man! Good on you for deciding to get in shape. I too admire the lion. Thank you for the nomination! It’s been a lucky time for me I suppose. I intend to tackle these questions by the end of February. Thanks again, mate! I very much look forward to reading your answers. I thought it was about time I got my body trim. That was mighty kind of you Lloyd. Nothing like a Bond montage to start the day. I think I would pick Morgan Freeman because of his voice haha! Indiana Jones and The Matrix are just incredible films. Lost Ark and Last Crusade are my favourite Indy films, although the less said about Crystal Skull the better! I could listen to Freeman’s voice all day. Indiana Jones, extremely special movies to me. Congratulations! Very well deserved, my friend! Naked hugs! I love the song Bittersweet Symphony, too! It burrows into the mind and is very difficult to get rid of. Thanks Eva, will begin working on my acceptance post this week. It’s good to learn more about you. congratulations! I attempt to make my answers as unique as possible. Thank you for doing this Ruth.